You should not wait another minute! You know that thing you’ve been considering, that looks too good to be true. It’s not. You will be SO passionate about being a coach, that you would do it for FREE…but you’ll make money anyway! Actually, you’ll make enough money in just a year and a half, to help your family take 2 vacations and open up some additional college savings accounts! What could you do with an extra $1,400/month!? Get this…you know those pounds that you keep packing on and can’t seem to figure out WHY? Even though you’ve run 5 marathons, you’re still not seeing the results you want to see. There are programs that will work better than anything you’ve ever tried. AND you can do them at home, and ask your friends and family members to do them with you! Your friends will workout with you, and your family members will all get RIDICULOUSLY fit! Your husband will lose like 40 pounds, because he sees you getting fit and healthy and he wants to join you! Remember how you were nervous you wouldn’t know what to do, or how to do it? PSH! You’ll meet such a cool bunch of people that will help you and encourage you along the way! You’ll meet new friends and have a BLAST! Oh and by the way…you know that friend who warned you that it was a pyramid scheme…it’s NOT!!! P.S….ALL corporations are structured like pyramids! 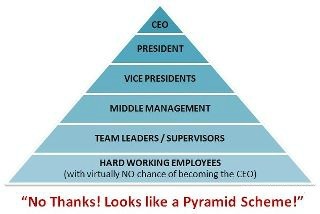 The only difference here, is that YOU get the opportunity to be a the top of your own pyramid! And you’ll get there by HELPING others succeed! *A little different than a traditional corporation! Don’t wait 4 more years to jump on this opportunity! Do it today and you’ll be amazed at the many positive changes that will come from it! You’ll lose 24 pounds, gain killer confidence and help hundreds of people get fit and confident, too! It’s the most rewarding thing you’ll ever do! I’m excited to announce another 30 Day NEW Coach Training group! One of the reasons people hesitate to sign up is that they fear they won’t know what to do, or how to do it (I had that fear)! That’s why I run these groups for new coaches! I am going to walk you through EVERYTHING you need to go to get you up and running; building and growing your own successful coaching business! *Sorry, not available to coaches, or anyone already working with a coach. My next group will start on Monday, May 12. Deadline to get signed up is Sunday, May 4. With consistent work, growing and building your business, you can expect your income to double every 6-12 months. Previous PostPrevious Dressed for SUCCESS! Next PostNext OMG – It Worked!